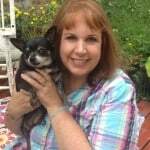 NOTE FROM CATHY: We have a guest post for you today from Linda over at Pawsome Talk. The Chihuahua is the cutest breed of dog you can have at home. There are many theories that discuss their origin. Some theories state that they came from Asia or America. They have stolen the hearts of many people, but owning them is a big responsibility. 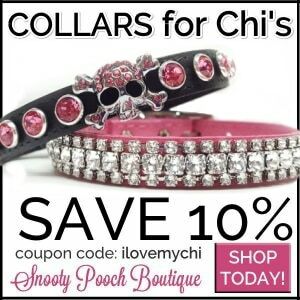 As the chi is a small dog, there are many things you must take into consideration. Before picking this cute furry little dog, you need to analyze all the pros and cons. Here we provide you with all the relevant information so that you can make a decision. 1. 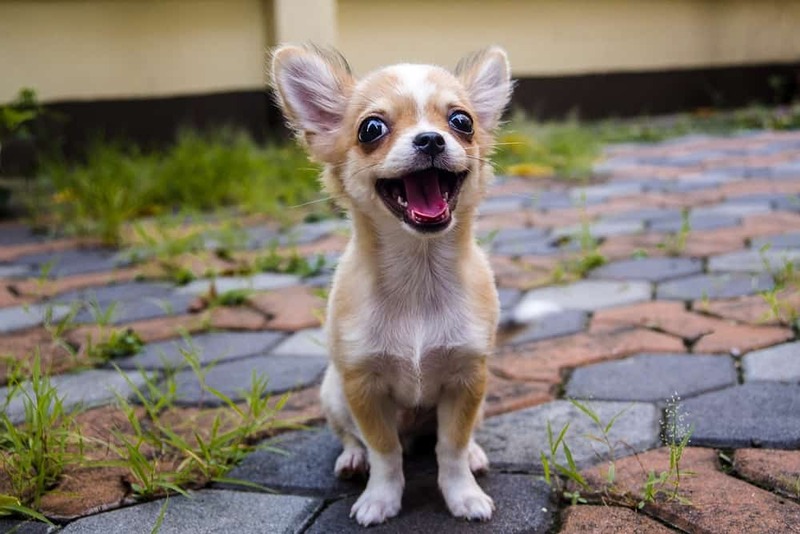 Chihuahuas are adorable and cute. They are the cutest dogs I have ever seen. They are so sweet and small that they can easily get fit into your arm or lap. They are very loyal and caring. It is fun to be with them and watch them playing for long periods of time as they are very affectionate. They will love you unconditionally. You can make homemade dog food as a treat to your loved pet. 2. They are excellent pets if you are living in an apartment. A Chihuahua is small in size. They do not require large spaces or fields to play. Your home can provide a lot of space for him to run, roam about and exercise. 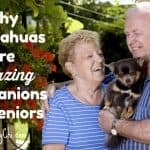 Chihuahuas have excellent eyesight and hearing capabilities and having them around provides security at home. It will alert you if a stranger enters or trespasses into the house. They are considered great watch dogs. You will feel less stress that burglars and thieves are sneaking in with these little guys around. 4. They are good learners and can be taught to use the litter box. I trained my Chihuahua to use the litter box inside my home. You tell them once that you have to litter here, they will obey you. Use newspaper or organic material inside the litter box. 5. This pet dog is easy to groom. Do you fancy having a well-groomed puppy? It takes only a few minutes to groom your Chihuahua. You just need to give them a refreshing bath and trim their nails regularly. As this dog has short hair, minimal time is required for brushing. Long haired Chihuahuas take a little more time but are much easier to groom than some other breeds. 6. They have a longer lifespan. This breed of dogs lives between 11 and 20 years; ideally, they live more than 15 years. The longer these dogs live, the longer you will be able to spend and nurture them. 7. They are a perfect travel buddy for you. Chihuahuas are small in size. Traveling with these cute, furry canines is very easy. They are so small that they can fit in a lady’s handbag. They love to travel with their masters and can become comfortable within small spaces. Therefore, carrying them along is convenient. 8. They are super intelligent dogs. 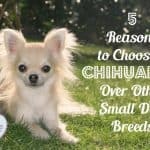 The Chihuahua breed is quick and intelligent. They are perfect for learning things; therefore, training them for various habits is easy. 1. Chihuahuas are fragile; you must take extra care of them. The Chihuahua is a comparatively weak dog and can easily get injured. They can hurt themselves even when falling from a couch, so special care must be required. For instance, I ensure that my ‘Chi’ doesn’t linger around electric cords, fences, heights, and large beasts. I watch him constantly to prevent injury. 2. You have to keep them warm. It is hard for the Chihuahua to survive in cold weather. They love a warm climate. You must put some clothes on them if you are going out with them in the cold. Yes, my ‘Chi’ is closer to my mother more than anyone else in my family. You must have noticed the same in your house as well. 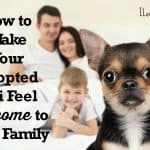 They usually aren’t family dogs as they are not able to create a bond with the entire family. If they feel uncomfortable or threatened, they can nip or bite. However, if this dog is raised and socialized from an early stage, they are excellent pets. Children may not be able to take care of the fragile dog. A simple and rough handling can easily harm him. Most Chihuahuas do not get well with the young children as they fear they will get hurt. Chihuahuas must be handled with care. 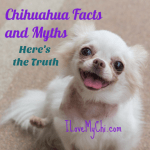 Chihuahuas are not the best choice of a pet if you are living in a location where silence is required. If the walls of your house are not thick enough, the barking sound will go outside the house. 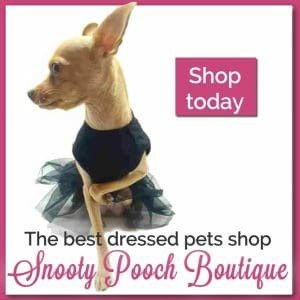 Chihuahuas are very particular about their territory and the place where they live. They don’t adapt well to changes in locations easily. You can train them to overcome this. 5. They are very sensitive and can have health issues. There are two sensitive spots in the body of Chihuahua. Melora: It is a soft spot on the skull where the skull does not close fully. Patellar Luxation: It is located where knee cap slides in and out of the tendon. This condition causes a lot of discomfort. Their skeletal system is weak and thin. Avoid letting your Chihuahua to do high impact exercises. These conditions (Melora and Patellar luxation) are easy to control with regular health checkups. They require a lot of attention and care towards their health. Other dogs can hurt them while playing. If another dogs snaps, it can be life- threatening for him. Chis tend to prefer other chis. Of course there are exceptions and some chihuahuas get along great with other animals in the household. They are prone to eye injuries so think twice before having a cat at home. So, can cats eat dog food? The food for cats and dogs are different. Cats must eat food rich in taurine, a protein. A dog can synthesize their Taurine. Cat food is too rich for dogs and can cause them to put on weight. My “Chi” is adorable; no matter how noisy he is at home. I cannot live without him, nor can any of my family members live without him either. 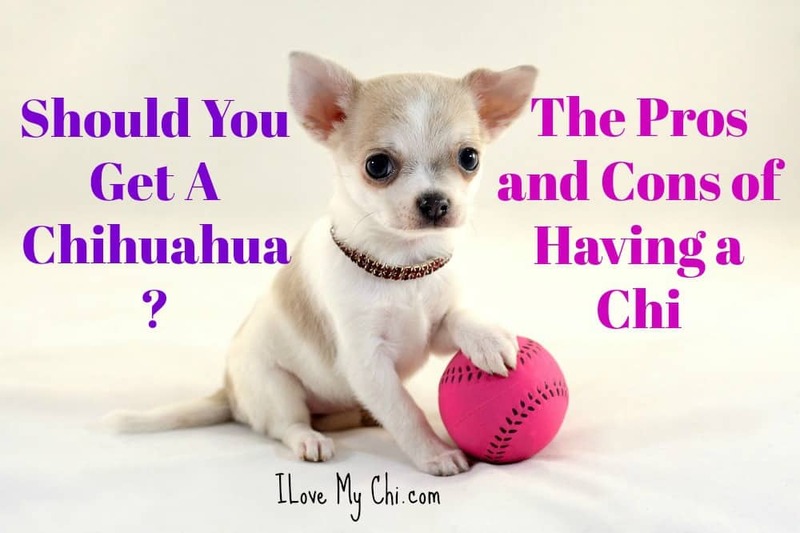 You have all the benefits and drawbacks of having a Chihuahua clear now; so, decide for yourself, whether or not to get one. For me, they are simply irresistible. My Chi is mine, and I am her person, but she is almost as much in love with my husband as we me. She loves both of our other dogs, a Chi mix and a Lab, and she adores the cats. Oddly enough, the cats are crazy about her. Your’e lucky Kay. My son rescued Kilo with the intent of her being his dog. Nope. She decided I was her human and I’m the only one besides my grandbaby that she likes. She tolerates the other dogs but she doesn’t like them. Keep checking petfinder.com for your area. And check Chihuahua Rescue here: http://www.chihuahua-rescue.com/midwest/ You never know when the perfect little man will pop up for you. I am so sorry for your loose. Looking your Mom, I can’t imagine how hard that must be and to loose your baby too. God bless you. Be patient, be open, and the right baby will come your way. Rebecca, I know a girl who raises them and they are all long hair chi s. Beautiful, tiny with wonderful dispositions! Only thing is she’s in the south. Louisiana I believe. I got mine from her last year. On Facebook look her up, she posts her puppies there. 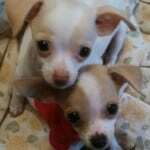 Cane River Chihuahuas, or you can always message me, Sharri Germann. Her dogs are worth it, mine is 2 yrs. Old and weighs 4 lbs. Good luck! My Chi is a service dog and does not bark unless the phone rings or someone knocks on the door. She is adorable and loves me so much as I do her. We go everywhere together. She became very attached to my son when he was living with us and fighting cancer. He lost his battle last Dec. four days before Christmas. My Chi whos name is Minnie greived for him so bad. It was so sad to watch her look for him to come home. He rode a Harley and she would ride with him. So everytime she hears a Harley she gets excited. Then the let down when He doesn’t come in. So I started taking her to visit his friends with me and she has now formed a bond with her Uncle and they seem to love each other dearly. He spoils her and she loves him lol but she still looks for my son when she hears a Harley. I am so sorry for your loss Tereasa. Your chi sounds like an amazing little dog. I have 2 chi’s. The smaller, older one seems to like everyone in the family but is hands down the boss between the 2. The younger, larger one has become mine. It seems I understand him better! Lol. He is very vocal and communicates by different growl tones which seems to scare everyone else…which is most likely what he wants. But if they pay attention to his behaviors they notice he is just communicating what he enjoys or doesn’t enjoy. They are each others best buddies and the bigger one always lets our smaller one eat first. I love them both very much. Dogs temperaments are so different, just like people. I have a big dog who is very vocal and has different growls for different “words”. He’s so big he terrifies people who don’t know him when he does that but he wouldn’t hurt a fly. That’s just the way he communicates. Thanks for the info Sharon. My 16 year old Chihuahua Montana passed in October. Her cat brother I know misses her. He hasn’t been the same. I’m a total wreck! I miss my girl so much. She helped me through tough times still going through and she saved my life several times. She was so special . I get panic attacks without her and cry a lot I’m so heartbroken. I’m glad I still have my cat that helped raise our girl so I’m not alone as I have no one else. Chihuahuas are amazing dogs. Montana sounds like she was a very special chi. I’m glad you had 16 years with her but I’m so sorry you lost her and are having such a hard time of it Lisa! We have had Toby and Diego now for almost 10 years. My wife is their primary owner and I am a close second. The are loving but demanding. At around 3:30 every week day, Toby and Diego get on the back of the couch that faces the front of the house, and wait for me to come home. As soon as they see my care pull up in the driveway, the ruckus begins. They both howl as I walk to to the front door, and both of them stretch up on my legs as far as they can to get their afternoon petting. They are fabulous dogs and get plenty of exercise chasing the squirrels, birds and possums out of our yard. They won’t, however confront the animals. If one of them stops while being chased, Toby and Diego stop a good distance from them. 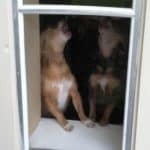 I laughed at the photo of them howling. So cute! Thanks for sharing Barry!